Ok I’m back. I needed a summer food fix so I threw together this fast little salad. 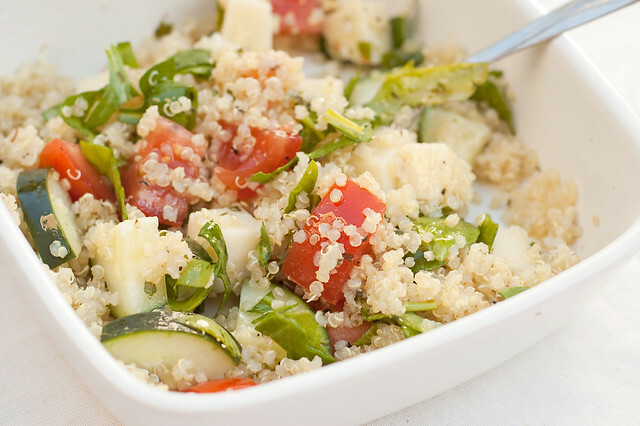 Quinoa is a great alternative to my favorite pasta, potato and rice salads and takes way less time to make. I discovered Quinoa a couple years ago at Trader Joes after hearing blogs rave about it online and had to try it. What drew me to quinoa is that it’s a healthy starch that cooks in less than 15 minutes. My main issue with brown rice is the long cooking time. I usually forget to start the rice first and end up waiting on the rice while everything else gets cold. If that happens now I just cook quinoa instead. 1. Combine 1 cup of cold water and 1/2 cup quinoa in a small saucepan on med-high heat. Bring to a boil then cover and simmer on low heat for 10 minutes. 2. While the quinoa cooks chop the tomato, cucumber, cheese, herbs and spinach. When the water is absorbed and you can see the dark grain rings remove the quinoa from the heat. Drizzle 2-3 tablespoons of oil and squeeze half a lemon into the quinoa, fluff with the fork to combine. Gently mix in veggies, cheese, herbs, salt and pepper. Enjoy hot or cover and place in the refrigerator to serve when cold. Quinoa is a fabulous grain. I am a dedicated home cook and never heard of quinoa until a few years ago; but then, there are so many new ingredients that we are finally hearing about. I made a very nice quinoa salad just yesterday with black beans. And I think quinoa tastes much better than brown rice. I also recently made a salad with millet, another great tasting grain. The current issue of Fine Cooking has a two page spread featuring grains in summer salads. They can also be accessed online (for unfortunately $9.99 a year), but I find I go back time and time again for new ideas but just searching by ingredient, so for me the $$$s are worth it. Enjoy your salad.